Like many would-be writers, I have had trouble breaking into the industry. Partly this is my fault. I wrote a novel first. And it was long. And philosophical. And it had a whole mess of characters and no clear genre. As a result, my efforts to find an agent were, quite predictably, unsuccessful. In an attempt to go in a more commercial direction, I wrote a few screenplays — one was about a bunch of breakdancers playing pranks on each other and the other was a sci-fi thriller. These received some interest from agents in L.A., but neither of them found a buyer. I knew that I should have started with small goals and so I set out to write some short stories and submit them to local literary journals. Unfortunately, the story that I liked best happened to be a little over 15,000 words — which is a completely unpublishable length for most magazines and literary journals. I decided that I would self-publish it as an e-book, because the cost of entry is effectively nil. I did my research and settled on Smashwords (because it redistributes to Barnes and Knobles, Kobo, Sony, Apple and other retailers) and Amazon (because it is a behemoth). I edited. I proofread. I did my own ebook formatting. I designed a cover, using a photograph which I took myself so that I wouldn’t get sued into oblivion if my ebook, by some miracle, actually took off. I uploaded and previewed and re-uploaded and set prices and promoted my book on Facebook. At this point, I already knew that the story would likely never be seen by anyone other than my friends and family. So I did what hundreds of would-be writers before me have done: I bought a mannequin from a discount mannequin retailer (yes, such a place exists in Toronto!). Perhaps the last step in my procedure isn’t entirely self-explanatory. Please allow me to explain. My story — Timothy Mallborn: The Invisible Boy — is about a little boy who disappears in a department store and gradually realizes that he is completely invisible. He fashions a little home for himself in the children’s section of the store and lives his entire life inside a shopping mall. Mannequins feature prominently in the plot. 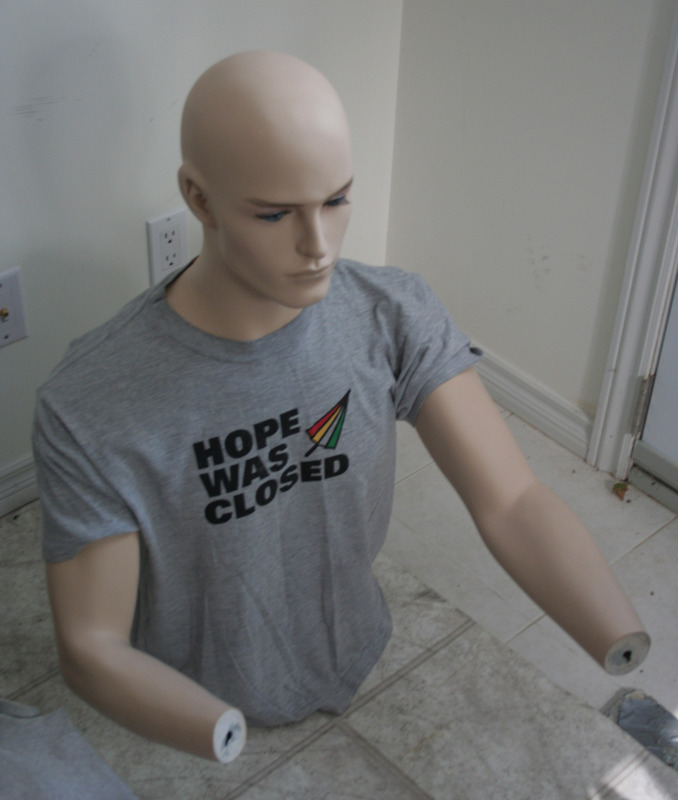 The story takes place in the Eaton Centre — the largest mall here in Toronto — so I hatched a plan to dress my mannequin and give him a sign which would offer a tantalizing introduction to Timothy Mallborn’s predicament and give a link to my website. I also plan to print out flyers and hand them out at the same time. That’s the whole plan. It is zany and ridiculous and doomed to fail. I got the shirt in Japan many years ago and I have always loved it’s nearly-sensical message. Preparation Pt. I is here. Preparation Pt. II is here. Or you can just use the scroll-over on the project mannequin button in the menu up above.